She wanted a design similar to some cabinet doors in a book case in the same room. This Arts & Crafts or Prairie Style was made popular by Architect Frank Lloyd Wright and is prevalent in Craftsman Style homes built in the early 1900's. Robin called me about building 3 small windows and a transom for her home in Chesapeake, Virginia. 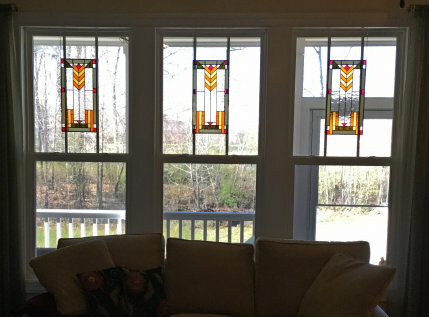 She sent a photo of the existing windows in her family room. 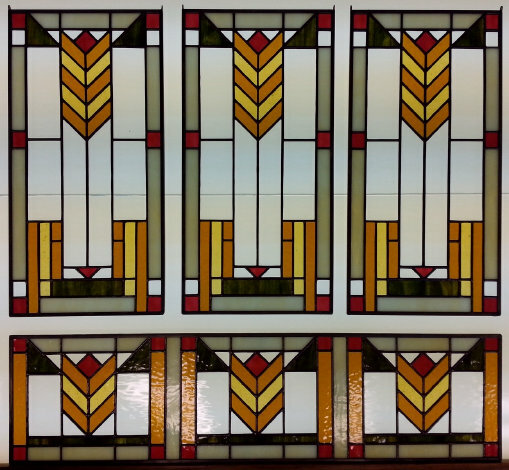 She wanted to build 3 small stained glass windows to hang inside of the top part of the larger windows. One of the challenges we faced in design was that Robin's Transom opening had two mullions (dividers) in the window. Our design used some white opalescent glass strips to split the design into 3 repeating parts....thereby obscuring the mullions. Robin must have been a architect in another life. She knew exactly what she wanted. She sent me a drawing to work from. She even did a paste up with colored construction paper to show me how the colors would work together. I sent her a box of glass samples, and after a lot of careful consideration, she sent a template back to me identifying the glass colors she chose. Nobody ever makes it this easy for me! Above are Robin's windows and her transom after completion. Robin's design is a perfect rendition of a design from a 100 year old Craftsman house. 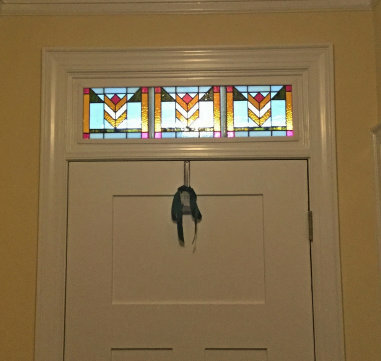 Robin was nice enough to send photos of her windows and transom after installation. She was a joy to work with on this project because she knew exactly what she wanted and was able to guide me to build it to her expectations. What a magnificent installation job! 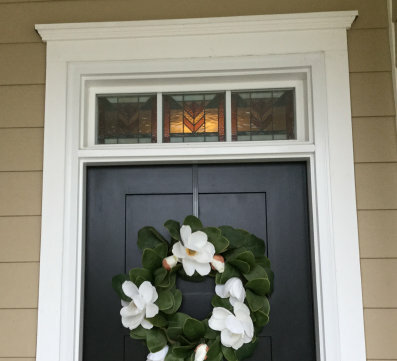 The transom part of Robin's Windows measure about 8.5" x 32.25" and contains 89 pieces of glass. The 3 smaller windows measure 10" x 20" and each contain 55 pieces of glass. All were completed in February of 2017 and are bringing color to Robin's home in Chesapeake, Virginia. Robin's windows were designed to fit perfectly in the center of her upper windows. See the above picture of Robin's windows after installation.